It's amazing how far open-world games have come, and what evolution of functionality have accompanied their growth. A game doesn’t need a meticulously crafted story and characters to be great. 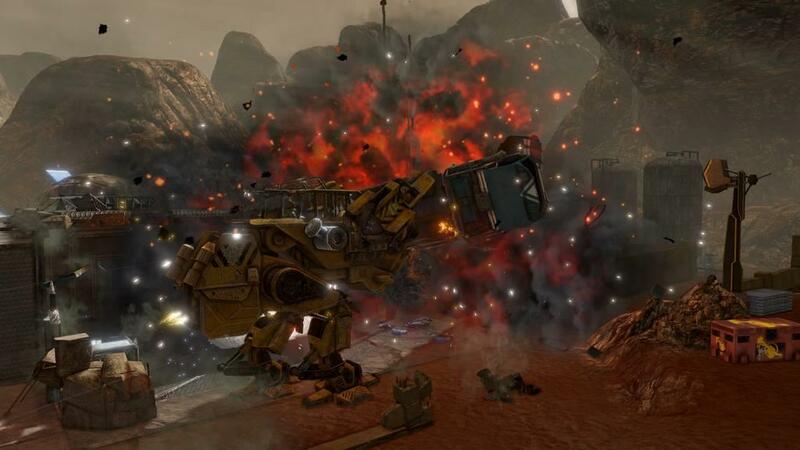 A remaster of Volition Inc’s 2009 title Red Faction Guerilla, this is a callback to the old school open world game, reminiscent of Fallout 3, Oblivion, and others, except where those games had intricate systems related to quests, crafting, and other RPG-related open world elements, Red Faction Guerilla mostly has one major element that helps it stick out from the pack: destruction. 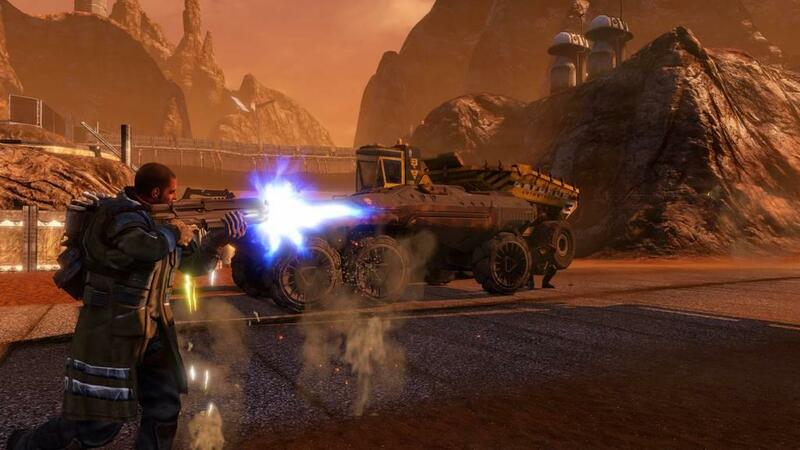 The third title in the Red Faction series, Guerilla takes place on a neocolonial version of Mars that is comprised of an oppressive, neoliberal Earth Defense force, which brutalizes its local worker population, and a burgeoning rebellion known as the Red Faction. It seemed, at first, that the game would use some of this pseudo-Marxist/Communist imagery (read: the sledgehammer in hand, both being the tool of your labor and the tool of your liberation. Also, the color Red) to say something intelligent, but it soon becomes clear that this is just set-dressing for an excuse to destroy everything. And I mean everything. Seriously, I haven’t had this much fun just blowing stuff up in a long time, and what’s better about it is that it takes various aspects of modern open-world games by making a larger point that world’s usage. With the contrast against RPG games of 2007-2008 I made earlier, I feel that I should bring up the similarities that Re-Mars-Tered has with some of its more modern counterparts. The main comparison I have to make is with Horizon Zero Dawn, mostly with how its open-world has an impact on how you succeed as a player. There’s pretty much a good reason to take on every enemy and pick every plant you see. You can make traps, new weapons, and new potions with each new item. Re-Mars-Tered works similarly. With each building or car or bridge you destroy, the more salvage you get. 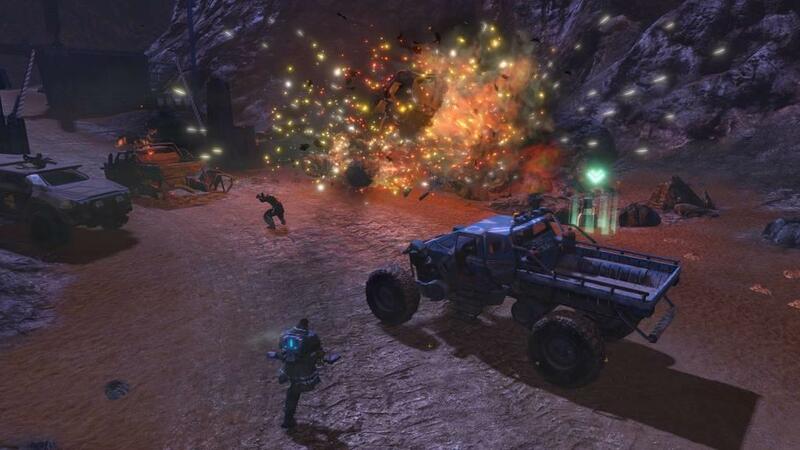 And the more salvage you get, the more weapons you can create, thus making the fight against the EDF that much easier. Everything that you do applies in some form or fashion to the outcome of your goals, which generally consist of booting the EDF out of a given area on Mars. 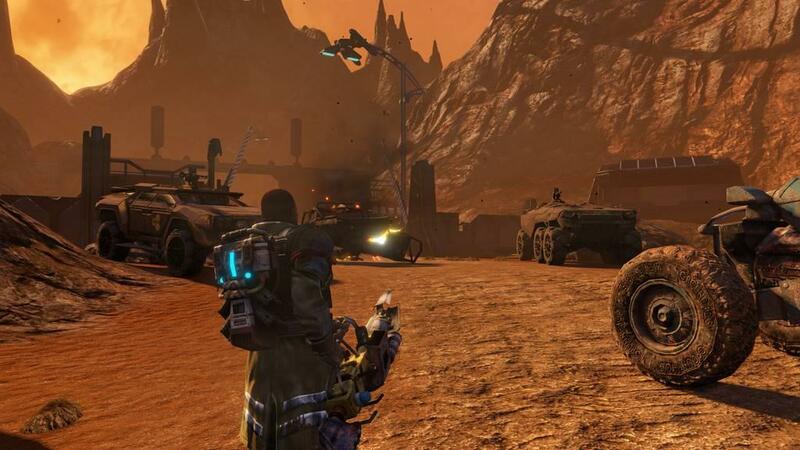 Main missions will have you launching assaults on various high value targets, or providing backup to evacuating allies, while side missions employ a smaller scale version of those, ranging from hijacking cars, to protecting against EDF assaults, to waging rampant destruction on the industrial-Martian landscape. Do enough of both types, and you’ll push the EDF out of an area. The experiences are both exhilarating, and different each time, thanks to the variety of tanks, walkers, jetpacks, vehicles, and other tools at your disposal. What’s great about this formula is that, besides just being a lot of fun, there is a critical need to perform these feats of ultimate destruction. There isn’t that much pointless content, and it isn’t a bad thing if you choose to ignore various side missions. The game seems to say: “you see that building? You wanna destroy it for the liberation of your oppressed labor force? Yeah?” and then you go do that. It’s a refreshing experience, to savor the feeling of pure gameplay. It’s somewhat unfortunate, then, that the game can’t supply a good story to go along with it. I’ll go into why this isn’t entirely a bad thing, but there are also some major sticking points that bring the game down. 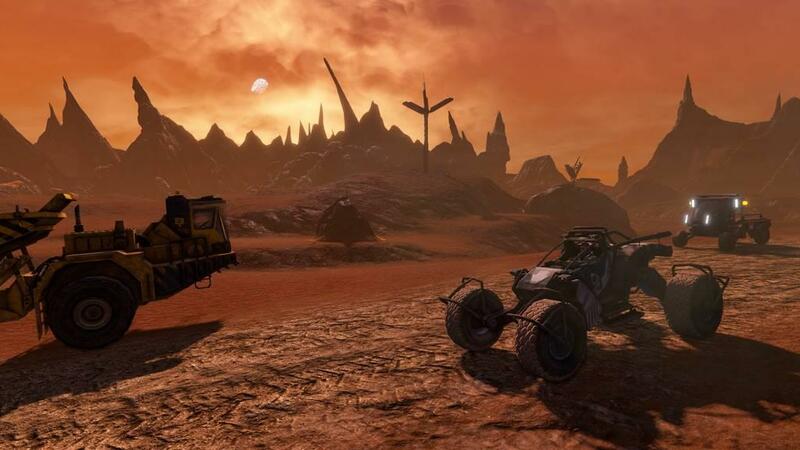 You play as Alec Mason, a blank slate of a protagonist with a barebones emotional connection on Mars that, when cut off, gets him into the Red Faction. There’s really nothing to say about him, and the game doesn’t try that much anyways. He is simply the player’s instrument of destruction. Two other principle characters, however, are significant when it comes to what the game tries—and fails—to say. First up is Jenkins, AKA your crazy sort-of-uncle (he’s not your uncle but I mean he might as well be) who drives a rig that you fire rockets from, destroying everything in your path. Jenkins rails against the corporate machine that is the EDF, and provides some interesting points for discussion. It’s too bad, then, that his rants are drowned out by the sound of your rockets and bullets, defending yourself against EDF baddies. 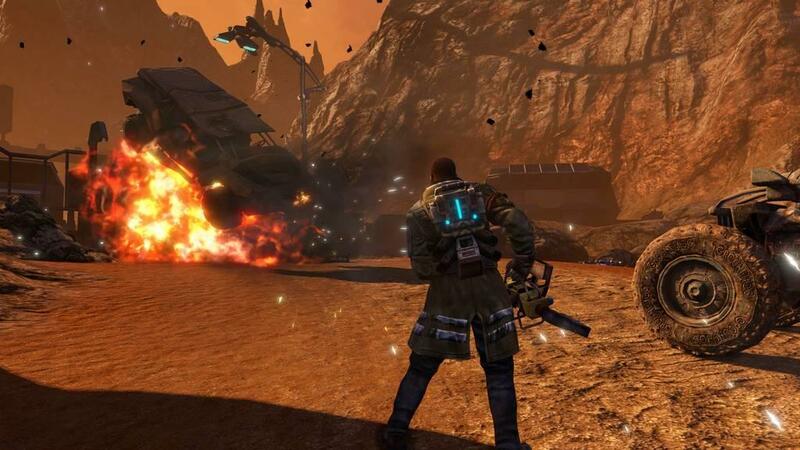 The story behind the game is pretty weak, with no real emotional beats until the end, so it would be nice if I could at least hear the food-for-thought that Jenkins pours out, because some of the activities that the Red Faction employs have actually been used by real anti-state organizations, only they’re terrorist attacks. These include in-game attacks on residential complexes and malls. The gameplay overshadows the impact of this, as the only thing that matters is the little meter that keeps track of EDF control versus community support. It’d be nice if the game at least tried to tackle some of these things, just to give some weight to your actions. The second aspect to the game’s (failed) introspection is the character of Samanya. She is probably the only NPC in the game that can actually be called a character, but there are ups and downs to that. On the one hand, it gives better perspective on the colonial vs. colonized aspect of the game, which is both superficial and convoluted, and probably wouldn’t hold up to greater scrutiny, which is why I’m not going to go into it (and also spoilers). But one thing that really got under my skin was the revelation of her name. Samanya, apparently, is from the African Bantu language and people. This is appropriate, because they were among the millions of African that were brutally oppressed during European colonialism throughout the 19th and 20th centuries, and even into today, given private, neocolonial policies of various businesses. Here’s where I have the issue though: Samanya is white. And worse: she’s British (just look up their colonial war crimes, such as concentration camps in Africa). I’m not going to spend too much time with this, because it’s not worth that much, other than to say that it is an idiotic blunder. That a colonial has now become colonized is perfect in its irony, but that this colonized colonial has adopted the name of a member of a colonized people is just kind of stupid. I say this because it is a perfect example of cultural appropriation. There are some revelations that happen later in the game that kind of assuage this, but it comes off as pseudo-romantic, and not very well thought out. But if you ignore that, which you pretty much have to, if you want to enjoy what this game is: which is nothing but dumb fun, then you’ll have a good time. It’s what I did, it’s what I had to do. Some things that I couldn’t really ignore both have to do with the more technical side of things. The first has to do with gameplay. The game makes a point of saying not to take on the EDF like Rambo, because you’re a guerilla, but in no time, Alec Mason becomes a one-man-army. The game says that you’re a guerilla, making hit-and-runs, but that’s not the case for most of it. That’s not to say that it’s not super-difficult at times, but there isn’t much diversity in terms of approach. The second is the crashing. My game crashed around ten times throughout my time with it. These crashes came in frozen forms, glitches, and others that lost me control of the game or forced me to close the application down from the menu. I would say it’s unacceptable that the game crashes this much so close to launch, especially on a system like the PS4, which is what I played it on. Granted, I’m not well versed in those sorts of technicalities, but as a consumer, I would like a cleaner experience. That’s pretty much it for the single-player. 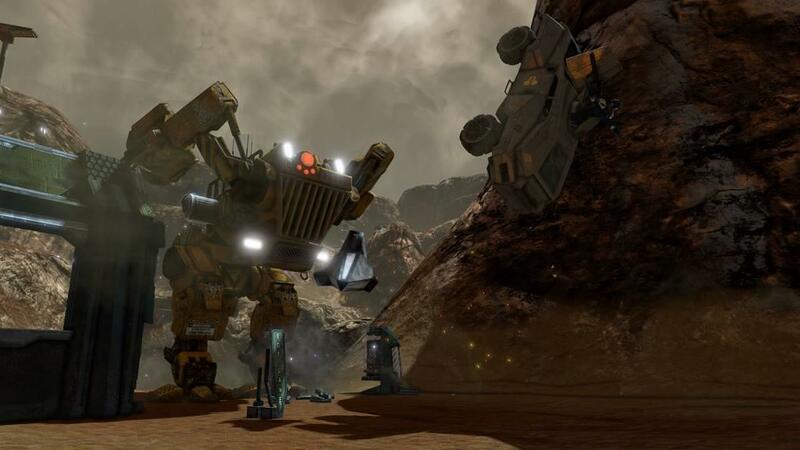 But other aspects of Re-Mars-Tered include all of the DLC packages from the original game, which include a single-player expansion, as well as all the maps accompanying both regular multiplayer and this thing called Wrecking Crew. Multiplayer has nine modes, none of which I got to play because either no one else who is reviewing this game is playing it currently. Wrecking Crew is awesome. I had plenty of fun by myself just blowing stuff up. I did have fun with this game. It stumbles when it tries to get serious, but it's not too annoying. It has yet to feel empty for me, provided the multiplayer can actually get up off the ground. Ultimately though, it provides a strong single-player experience that is worth a try. 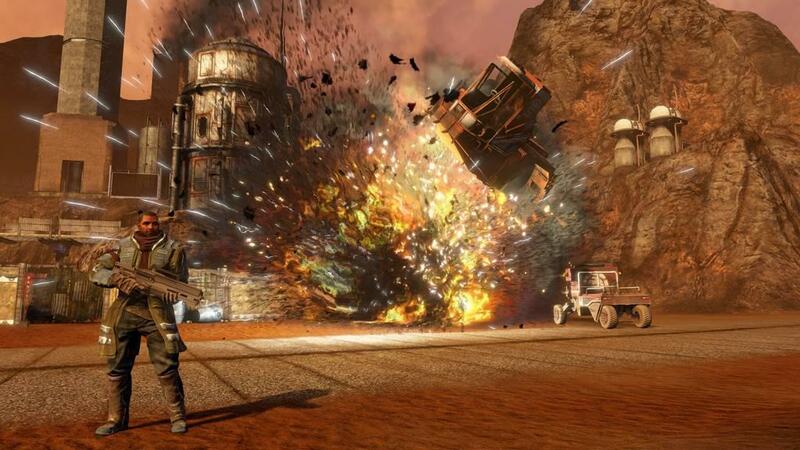 Red Faction Guerilla: Re-Mars-Tered is, in the end, a terrific, if seriously flawed, open-world game. I do admit that I’m a bit biased against this thing called colonialism, but the writers should have examined the wider ramifications when trying to inject even a semblance of emotional connection into the game. Overall, it’s a fun jaunt through the past, and although I’m sure I’ll get tired by the eventual repetitiveness, just like all open-world games, it’s a great experience for what the gameplay provides.